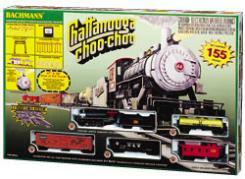 This is the Chattanooga Choo-Choo HO Scale Electric Train Set. Retail $269.00 SAVE 37% ! Nice Beginner set. Easy assembly. Station is nice and easy to assemble. People are unpainted. Highly detailed locomotive and freight cars. Highly detailed USRA 0-6-0 steam locomotive with operating headlight, smoke, short haul tender and tube of smoke liquid. A Dixie Line off-center caboose. Factory installed E-Z Mate couplers. Signal bridge and suburban station. 48 railroad and street signs. 48 male and female figures. A helpful VHS video with assembly instructions.